Pasta is often used as a delivery vehicle for sauce, considered too bland to stand alone. However, with a pasta maker at home, you can create delicious flavored pastas including spinach fettuccine and sweet potato gnocchi that require only a light butter sauce or drizzle of olive oil. Our top pick is the Philips Avance Pasta Maker because it takes care of the entire process for you, including weighing the flour, mixing and kneading the dough and producing a large variety of delicious and quality noodles. 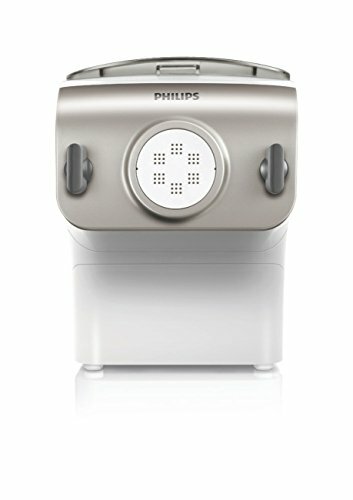 Although some purists prefer to roll up their sleeves and take care of the kneading process themselves, and love the authenticity of a hand-crank operated machine, we love the convenience of the Philips. Basic pasta can be as simple as flour and eggs. There are varieties of flour specific to pasta-making, but nearly any flour can be used to create pasta if mixed with care and used in shapes that conform to the flour’s capabilities. Without a pasta maker, you can mix your dough with a heavy-duty hand mixer and a dough hook or KitchenAid mixer attachment, but you’ll need to roll out and cut the noodles. There are tools to help with this process, but fans of light, thin noodles – such as ramen – will struggle to come up with a pasta format that they can enjoy. However, there are hand crank pasta cutters that can help you customize your homemade pasta. With an electric pasta maker, you can make your dough and extrude your noodles from one machine. Many pasta makers offer multiple extrusion discs for a variety of shapes, including thin angel hair, thick fettuccine noodles, and round penne. Fans of fresh pasta know that there’s a fair bit of work in mixing the dough, rolling it out and cutting it. These same fans also know that the outcome is well worth the labor! However, if hand-cut pasta is not possible with your schedule, you can still enjoy fresh pasta thanks to one of the many automatic pasta makers or pasta cutters on the market. Homemade pasta machines offer cooks the chance to load the dough components into the tool and let it do the mixing. Once the dough is mixed, the machine extrudes it through a feed chute where you can capture it for cooking. The best pasta maker is the one that suits your schedule and storage needs. While you may need a compact unit, be aware that there are small pasta makers available that offer plenty of power. Many cooks prefer tools that are dishwasher safe, such as stainless steel cookware. Again, if you’re preparing noodles that include eggs, getting everything washed up safely is critical. ​Check out the following to help you better understand the differences between types of pasta makers. This Marcato pasta machine is similar to the Marcato Atlas reviewed at number 3 below, but this model has no motor. While you’ll have to turn the crank by hand, we think most people should be able to operate this machine fine without any outside assistance. That said, it’s a bit slower than the motor-driven model and having a free hand is certainly nice. 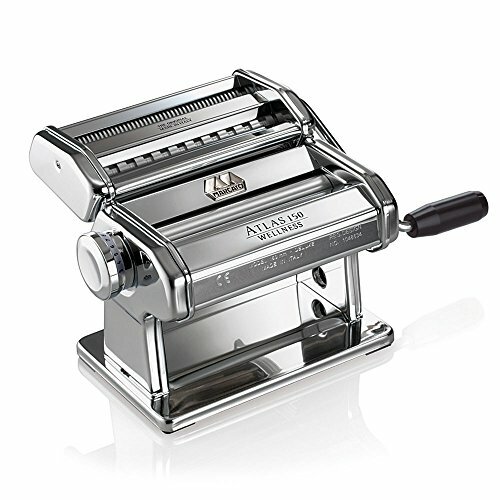 Slightly wider than the motor-driven Atlas, it’s made with the same authentic Italian parts and can produce flat sheets or two cuts of noodles out of the box. A variety of accessories can be purchased separately to increase its functionality. As far as functionality goes, this Marcato is awesome. Once you’ve made your dough and flattened it out, you’re able to smoothly feed it into the machine and get whatever thickness noodles you want. Like other traditional machines, cleaning is simple, as long as your dough isn’t too sticky or runny. You can simply dust the machine with a paper towel and it’s ready for the next batch. The stock standard machine makes lasagna, fettuccine, and tagliolini, although you can buy a wide range of accessories for many different pasta shapes. This unit is attractive, with an authentic, somewhat traditional look. It’s made from gleaming stainless steel and is super easy to clean after use. There aren’t a lot of differences between this and the Imperia pasta maker. The Imperia does, however, have a habit of fouling the edges of extra-wide pasta sheets. Traditional pasta machines are great for extruding thin sheets of pre-made dough, but that’s all they do. 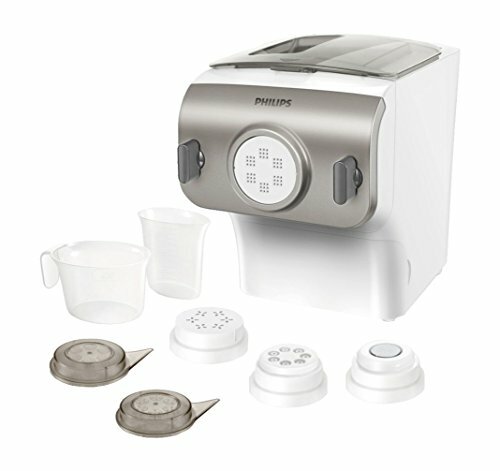 The Philip pasta maker helps mix and knead dough as well, making the whole process much simpler. Newer models even have built-in scales that weigh your flour and tell you how much water to add, giving you perfect dough every time. Philips understand that you’ll want to measure, mix and knead your own dough sometimes, so the machine includes an extrude-only mode that simply shapes whatever dough you put in. There are several included extrusion disks that give you a variety of shapes to choose from. The machine features a drawer on the bottom to store four disks, and Phillips includes a cleaning tool to push bits of dough off of your disks after each use. Like all the pasta makers we recommend, you’re free to use this for cake toppings, cookie dough, or anything else you want to force into vaguely pasta-like shapes. Unlike the traditional machines, however, this will mix your cookie dough for you. The convenience offered by this machine cannot be overstated. Traditional pasta makers require you to feed in pre-made dough and (often) crank your device by hand. With this machine, you throw in flour, water, and eggs, press a button, and you’re done. You’ll have a bowl of noodles ready to go before your water is done boiling. It’s worth noting that traditional pasta machines can’t do circular noodles with holes in them. The Philip pasta maker comes with a penne attachment in the box, and it works great. If you want more options than just different thicknesses of noodles, you’ll want to choose either this or the Lello below. This isn’t the cheapest machine, but we think it’s great for many kitchens. It’s incredibly simple to use, and the fact it mixes and kneads your dough for you makes it great for pasta novices. The Atlas pasta machine has a built-in motor, freeing up the hand that normally has to drive a crank on manual machines. It has nine roller settings to regulate thickness and two cutter attachments for different kinds of noodles. The machine itself is beautiful and well made. Other than the motor, it’s almost identical to the crank-driven Marcato we recommend, even featuring the same prominent Marcato branding. This motor-driven machine is slightly narrower, but the addition of the motor means it’ll make pasta quite a bit faster. The resulting noodles and sheets wouldn’t be out of place at any restaurant. Like other traditional pasta makers, this is a fairly bare-bones machine. You’re left to your own devices when it comes to making dough. If you’re interested in a machine that helps with mixing and kneading your dough, you’ll want to check out the Philips or Lello we recommend. The addition of a motor instead of a crank adds a decent amount of cost and complexity. In our experience, making pasta with a crank driven machine requires slightly more than two hands: in other words, you’ll do okay with a crank, but you’ll have to do some preparation and thinking beforehand. The addition of a motor lets you feed dough with one hand while leaving the other free to direct noodles as they come out, sprinkle flour, and adjust dishes on your counter to better catch the pasta you’re making. Is the Atlas Pasta Machine worth it? If you make a lot of pasta, we think so. The increase in speed alone makes the motor a nice upgrade to a crank-driven model. This Weston manual pasta machine is one of the cheapest on our list, but that doesn’t mean it’s inferior quality. You’ll find a solidly built unit that feels heavy and high quality. The machine has adjustable rollers which click into place for seven different thickness settings. Each setting from one to seven is roughly equivalent to one playing card in thickness. The stock standard set comes with a double cutting head to make either fettuccine or spaghetti, but you can purchase extra cutting heads for other styles of pasta. If considering this pasta maker, bear in mind that you’ll need a suitable countertop or tabletop to clamp it to (using the provided clamp.) Unfortunately, the clamp isn’t the most well-made. The hole it attaches to in the machine is too big and you may struggle to keep it completely still during use. It’s not too tiring to work the manual crank handle, although if you’re making a lot of pasta you might be wishing you’d purchased an electric model. The handle can be frustratingly loose too; you’ll likely find it falls out of the machine quite regularly – not a major design flaw, just annoying – and painful if it drops onto your toes! Be aware that you might need to run a test batch of dough through the machine the first few times you use it to ensure it’s clean – the manufacturer doesn’t recommend washing it with water. 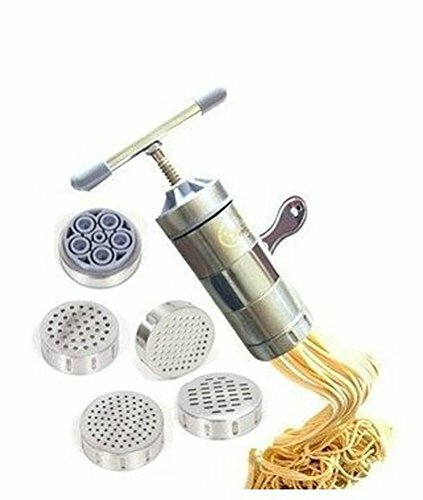 If using it without a test-run, you may end up ruining a good batch of pasta with residual metal chips and powder that are trapped inside. 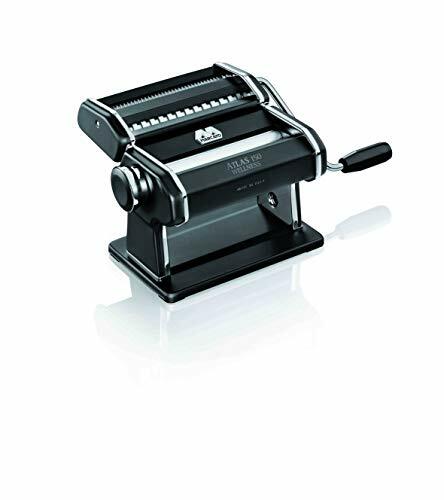 Overall, this is a great starter unit, ideal for those wanting to get into home pasta-making without investing in an expensive machine. 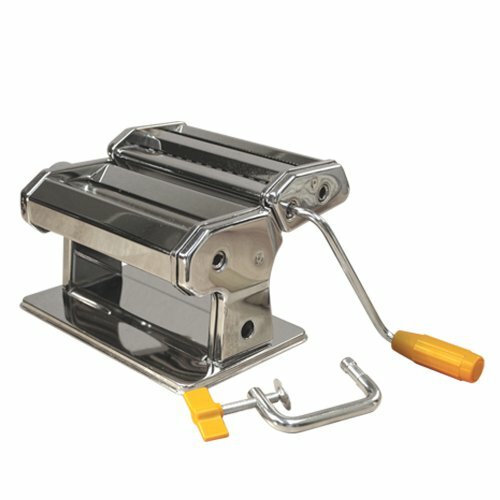 This model is rather unique within our list of reviews in that it is a small, hand-held pasta extruder as opposed to a countertop machine. It works in a similar manner to a garlic press; simply insert the dough into the chamber and start twisting the cover to push the dough through the holes. The Newcreativetop Manual Noodles Press Pasta Maker comes with five different noodle molds. It can make flat noodles with a five-millimeter width, or round noodles (like spaghetti) with either one, two or three millimeter widths. Supposedly this press can also produce macaroni style hollow noodles, but it doesn’t seem to do so very successfully. The process to push the dough through hard enough to extract the noodles can be quite difficult and you’ll need a bit of strength and energy to do so. We don’t recommend this unit for those with wrist problems or lacking arm strength. Clean-up is super easy – all components come apart simply and can be rinsed and washed in the sink. It is unclear exactly what material is used to make this press – it advertises mostly stainless steel but appears to have some aluminum as well. Regardless, for the price, it’s well made – the only cheap part is the plastic lid. As a bonus, you can also use this press to produce fruit juice. Some users have even used it as a garlic press or cheese dispenser. When it comes to producing pasta, it’s a super cheap option that will do the bare basics to an acceptable quality. We don’t recommend it for a die-hard pasta maker, but if you want to make your own spaghetti and only have a few dollars to spare, give this a go. 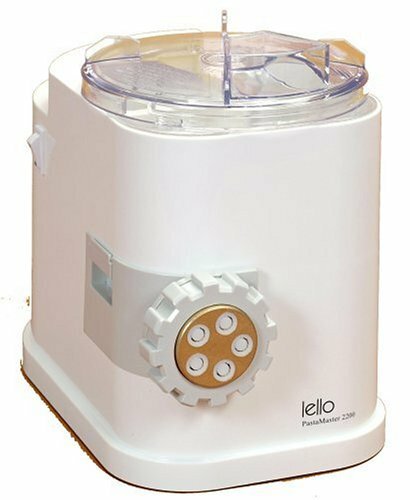 The Lello Pastamaster also mixes dough for you and extrudes pasta in a variety of shapes. It’s not quite as hands-off as the Phillips, however. You’ll find yourself checking in on each 20-minute pasta cycle a few times to make small adjustments and move the machine from one stage of pasta making to the next. Overall, it’s still an excellent tool that makes producing homemade pasta a simple and easy process. Once you’ve started a batch of pasta, Lello recommends that you monitor the dough as it mixes and adjust the texture by adding more water or flour. In practice, you can skip this stage if you’ve got some experience making pasta and you’ve been careful with your measurements. Expect to spend a few minutes playing with your dough consistency on your first attempts, however. Extrusion happens as soon as you open up a shutter on the bottom. This means it’s up to you to determine when your dough is done mixing. This can be a nice upside to some recipes, but it also means you can’t just pour some ingredients into the machine and come back to a bowl of pasta. The machine comes with six extrusion disks in a variety of shapes, but it’s possible to purchase extras if you want more variety. Like the Phillips, you’re able to make penne and other hollow noodles with this unit. Although how it operates is far more important than how it looks, we should mention that this machine is rather unattractive; it may not be something you will proudly display on your kitchen countertop. The upside is that cleaning is easy; the parts are dishwasher safe. 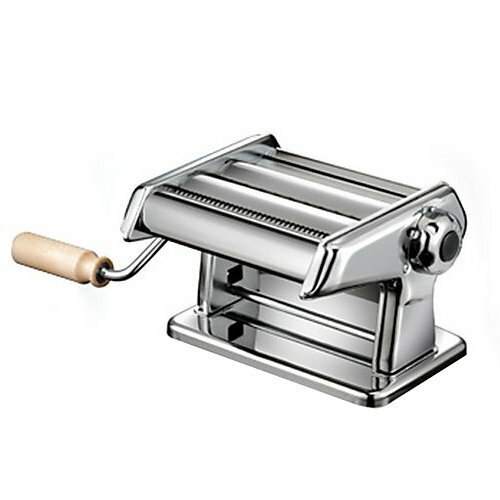 Like the Marcato at number one, the Imperia Pasta Maker is a traditional crank-driven pasta machine. It’s incredibly authentic (a lot of the documentation is in Italian) and does a fantastic job of converting your pasta dough into thin sheets or noodles. This machine is available in two varieties. The Model 190 has an integrated cutter and makes noodles only (no lasagna sheets). The Model 150 makes lasagna sheets by default and has an attachment available that cuts the sheets into noodles. Imperia’s pasta machines work best when you keep dough towards the middle of the rollers. While you can make use of most of the provided roller space, the edges have a habit of fouling your dough with grease. It’s easy enough to trim the edges off or discard a few noodles, but it’s a slight downside over the Marcato. Cleaning traditional pasta machines is a bit odd. You’re not supposed to clean them at all. As long as you use an appropriate dough recipe, your machine should be almost completely clean after each use. In fact, Imperia suggests that you run a load of dough through the machine when you first get it to clean out any bits of metal, grease or oil that might be left over from the manufacturing process. If you’re comfortable making dough, this works out great. If not, you might want to consider a more modern machine that’s easier to clean if you screw up. If you’re after a crank-driven traditional pasta maker, the Imperia pasta maker is one of your best choices. You’ll get an authentic machine with a lot of character. Like bread dough, pasta dough has a texture and weight that cooks get accustomed to. Be prepared to experiment when producing your first few batches of pasta. No matter who or what does the mixing, homemade, freshly cut pasta is an amazing treat. Each cook has their own preference for dough stiffness, thickness of the rollout, and width of cut. We reckon you can’t go wrong with the Philips Avance Pasta Maker. It’s attractive, high-quality and takes care of the hard work for you. It’s capable of producing more than just basic spaghetti and even comes with a penne attachment.